Any focus proceeded by a keypress should trigger focus-visible. Ah cool, you're on it already! Nice 🙌. Watching now. I can also open this as a new issue, if that would be more appropriate. First of all, thanks for this library. Really liking the polyfill efforts from standards orgs. User has used the mouse to select elements. No focus styles applied. User hits the <kbd>cmd</kbd> key for a fraction of a second before hitting <kbd>tab</kbd> to switch to another window. Focus styles appear for this fraction of a second, causing a confusing flash of styles before the window switches. The flashing of styles while using <kbd>cmd</kbd>-<kbd>tab</kbd> does not appear in version 4.0.1 of the library. If there's a very important reason that the changes from this pull request were made, maybe there can be a smaller blacklist of modifier keys (window and tab switching keys, for example) that it won't trigger on? Approach sounds pretty good to me! What does the support for token aliases enable? I'm assuming both of these problems are known issues with version 2.0.4? 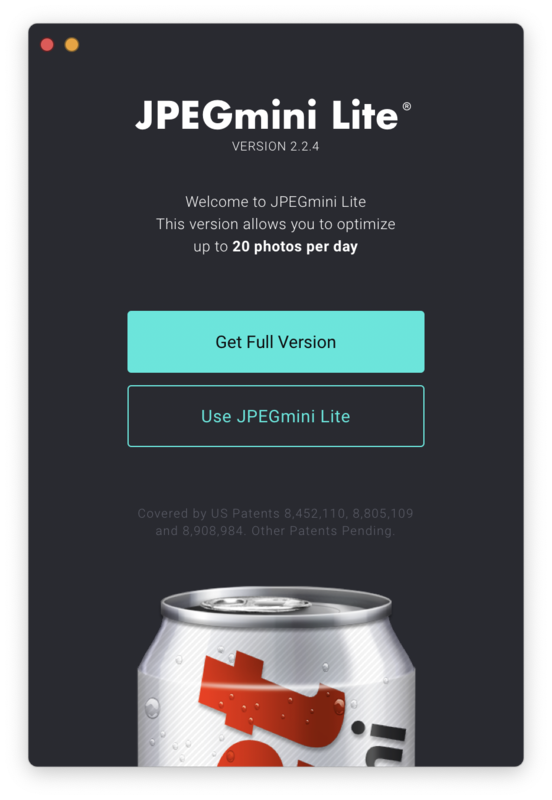 The current workaround that I am using (didn't find this documented anywhere in the readme) is to manually open JPEGmini Lite before using the CLI and manually click on the "Use JPEGmini Lite" button. Would it be a good idea to document this somewhere? Or should I submit this as a separate issue? @appsforartists Seems like #69 added invisible Previous and Next buttons to the UI already. Hi, first of all, thanks for this project! It would be nice to have a favicon to identify the tabs when no titles are shown (see screenshot below). It looks like the docs are being built with gx, but I didn't see on first glance where a PR would be made for a favicon. Maybe an option would be a monochrome / adapted version of the logo image? Ok this sounds like a plan. I took a look through the project (I've filed this issue in the wrong repo) and found the files that will be probably interesting to me. I've documented these decisions in rebassjs/rebassjs.org#15. Closing this. Cool, I'll do that then when I get a chance. Do you have a vector non-animated version of the logo handy? Okay, seems like you have some pretty strong opinions. Since you're the sole maintainer at the moment, if we don't find another way, then it seems like it's that is the way to go. People won't need to go through the whole fork/PR flow to edit docs. Hopefully in removing that barrier we'll have more people contributing. I would propose that forking + PR + review + approval is such standard practice and no less well-known than editing the Wiki (which may or may not exist for a GitHub project - readmes are almost always present). Totally get this. Maybe the solution is not a new tool, but another maintainer? I'm sure there are a lot of passionate people that would like to get involved here (myself included). Maybe open a call for co-maintainers? If angular/react are able to do solve this, why can't we? Angular.js is the old pre-v2 Angular. 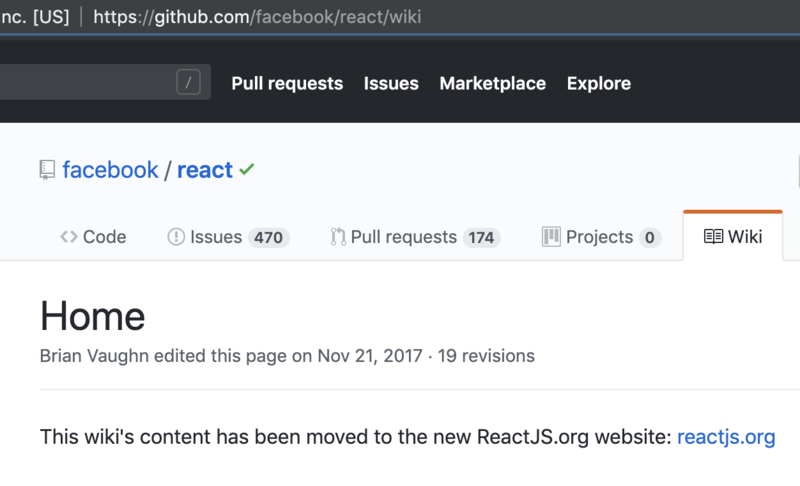 The new Angular does not use GitHub wikis. I have not seen GitHub wikis effectively implemented in open source projects except for a few academic project exceptions. And even then, it was confusing to have them separate from the other documentation in the project (which was in code). Portability? Not sure I see your argument there. Forking the repo will also fork the wiki AFAIK. Portability is not just about forking. Cloning the project does not clone the wiki (you have to use a separate URL for this, which again, may or may not exist). And once forked, the wiki doesn't follow the normal PR flow. This is the first use case that I would agree justifies a new tool. But I would suggest to do this separately and only for community discussions. And now that GitHub has acquired and integrated Spectrum, maybe that would be a better option for a community platform. Organization. The Readme is a hella verbose to the point it's getting hard to find things unless you know where to look. A wiki will help us put these into sections and such. Interesting, I actually see this as a plus. I like going to one page and being able to use the super-fast Find in Page in my browser to find the information that I need. For example, I like the Ramda docs. 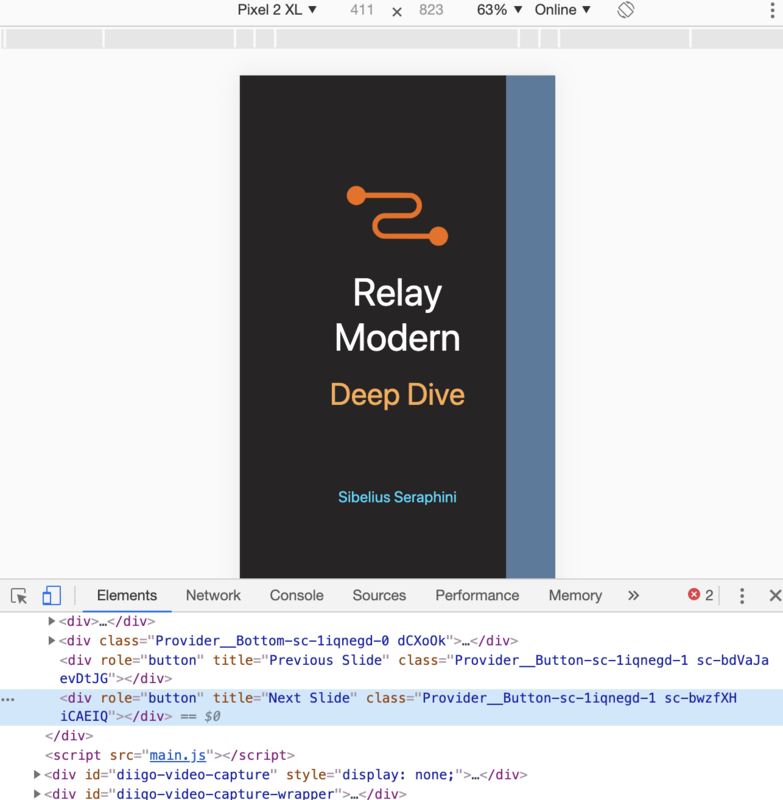 create-react-app also had their docs in one markdown page for a bit (now they are fairly established and can support a full docs site). Make 'Doc link(s)' field and 'Explainer link(s)' field optional. Good idea, I've added the link to the original description too! Maybe this should be either documented in the rebass docs or the as change reverted until styled-components fixes their issue? Or do the other issues with providing as in the API again outweigh this? What are the issues @jxnblk? I would suggest against GitHub wikis. It moves the documentation out of code into a proprietary system (which first of all means, one more thing to maintain, one more system to have to configure). I have found that it decreases visibility of the documentation too, leading to confusing situations and splintered SEO. Having the documentation in code allows for portability and also interesting other features, such as updating the documentation for features as part of their pull requests. I don't see any positives from moving to a GitHub wiki. If the VSCodeVim team decides to nevertheless go for a GitHub wiki after consideration, I will update the wiki. Feel free to close this if GitHub is not the right place. @AlexPattison ah that's no good. I've opened #3670 to document this and reword the note about the less-performant alternatives. As @AlexPattison mentions in https://github.com/VSCodeVim/Vim/pull/3623#issuecomment-481473981, there is a caveat that causes motions involving <kbd>j</kbd> and <kbd>k</kbd> to not work with the performant line-wrapping solution. This documents the issue as well as linking to a solution if this caveat is unacceptable to users. Before I start, I want to mention that I tried submitting this to the "File a content issue" link 3 times, but it didn't work (it said "successfully posted" but then did not show up in the list of topics). Thanks for this resource, first of all! It's super helpful for looking at the progress of features on the web. 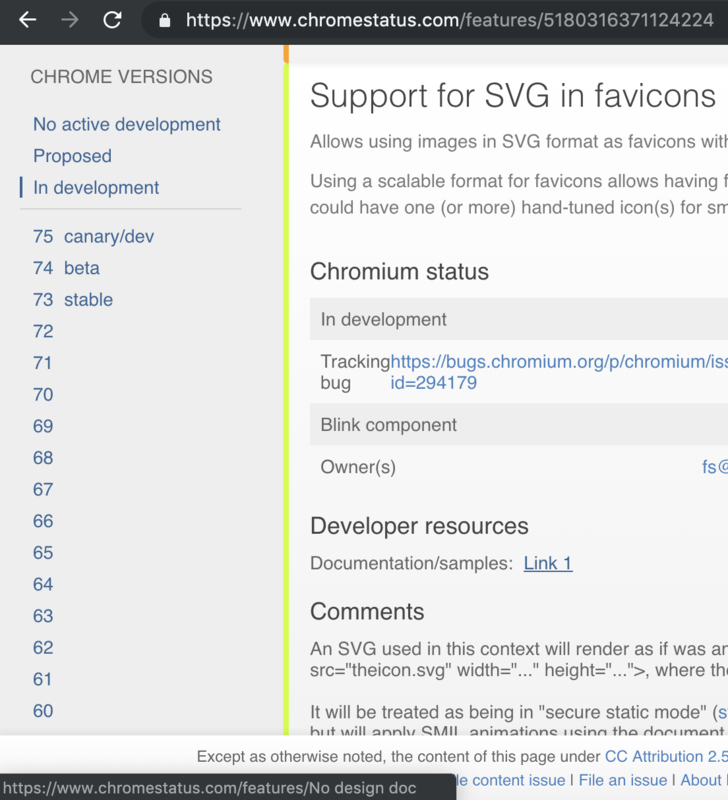 I clicked on the "Link 1" link in the Support for SVG in favicons section, but it appears to go to https://www.chromestatus.com/features/No%20design%20doc , which doesn't exist. I wanted to open a pull request here on GitHub, but I couldn't find the content that I was supposed to edit there (or even if it was on GitHub at all). One further use case for building multiple slideshow decks would be to enable quick switching between them during a longer course. Hm, that will have problems on non-dark mode tabs, wouldn't it? I guess my suggestion would be to fill in the transparent parts as well as a 2 pixel margin around it with white (2 pixels when it's shrunk to favicon size). Maybe we should have a background color for dark mode? So that the favicon doesn't show black on dark gray like GitHub? As in TBD, it would be nice to have a favicon to identify the tabs when no titles are shown (see screenshot below). It looks like the docs are being built with gx, but I didn't see on first glance where a PR would be made for a favicon. Thanks for this repo and proposal! This has the potential of removing an incredible amount of shipped JS for newer browsers. Just a quick PR to add the link to the TAG design review. Maybe it was 0f6a30379757e779c96ff23256909454beba56bd that introduced this issue? @droidmonkey Looks like this broke the favicon. Weirdly enough if I try accessing the new files, they are redirected with a slash at the end. It seems like there's a rewrite in the .htaccess that is putting slashes at the end of requests, could that be the problem? Yep, intended. The icon will appear in a rounded rectangle with a white background on iOS. Should I do another PR for this? Hi there, thanks for this project! Just a quick PR to add the Chocolatey package as a download source for Windows (similar to Homebrew on macOS). It's possible to move among display lines with <kbd>j</kbd>, <kbd>k</kbd>, <kbd>↓</kbd> or <kbd>↑</kbd> by remapping key bindings as I documented in #3623. Hm, not really, Prettier doesn't work like ESLint in disabling certain rules - it's low-configuration by philosophy. So unless we want to disable all of the Markdown formatting everywhere (*.md in .prettierignore or removing .md here), there's not many options in between as far as granularity goes. Great, cheers for the feedback. Feel free to disable it for all MD files; it'd be harder to maintain special casing specific blocks. I'm not sure I understand here... Won't this also be needed for visual line movement across word wrapped Markdown files?